The tariff war between the US and China is benefitting India as its exports to the neighbouring country have increased by about 25 per cent during the June-November 2018 period to USD 8.46 billion, apex exporters body FIEO said Thursday. Exports to China had stood at USD 6.37 billion in June-November 2017. In June and September 2018, the US announced high customs duties on several Chinese goods. In retaliation, China also raised levies on American goods. "US-China tariff war is benefiting India. Exports to China jumped from USD 6.37 billion in June-November 2017 to USD 8.46 billion in June-November 2018," Federation of Indian Export Organisations (FIEO) President Ganesh Kumar Gupta said in a statement. He said commodities that have exhibited high growth during the period to China include petroleum products, chemicals, cotton yarn, plastic raw material, and marine products. India is taking several steps to promote shipments to China. Recently it has managed to export agricultural goods such as non-basmati rice to China. India is projected to grow at 7.5 per cent in 2019 and 7.7 per cent in 2020, an impressive over one percentage point ahead of China's estimated growth of 6.2 per cent in these two years, the IMF said on Monday attributing the pick up to the lower oil prices and a slower pace of monetary tightening. China which grew at 6.9 per cent in 2017, as compared to 6.7 per cent by India, had a growth rate of 6.6 per cent in 2018. In the next two years - 2019 and 2020 - it is projected to grow at 6.2 per cent each, the IMF said. "The growth will be supported through further realisation of efficiency gains from the newly adopted Goods and Services Tax and policy impetus expected in the first year of a new government," said Ranen Banerjee, Partner and Leader - Public Finance and Economics, PwC India. India's economy has been on a rapid growth trajectory in recent years, prompting some to predict that it will emerge as the second largest economy in the world by as early as 2050, behind only China. One area where the country is lacking, however, is that of manufacturing capacity. To address this gap, one of the most prominent initiatives introduced by the current administration is the 'Make in India' campaign, aimed at investing in local manufacturing capabilities as well as drawing foreign investment in the sector. These efforts have been praised by experts worldwide. According to a new report by Big Four accounting and advisory firm PwC, these efforts appear to be producing the desired results to a large extent. Not only has the firm found a spirit of optimism prevalent in the Indian market, but major economic agencies such as the International Monetary Fund have indicated their approval of India's progress in this domain. "India's economy is picking up and growth prospects look bright - partly thanks to the implementation of recent policies, such as the nationwide goods and services tax (GST). As one of the world's fastest-growing economies-accounting for about 15 percent of global growth-India's economy has helped to lift millions out of poverty," says the IMF. The IMF is not the only international body to have registered its approval, with the United Nations Development Programme and the World Bank also registering their approval. According to PwC, this progress can be attributed primarily to the GST, as well as the Digital India and Startup India campaigns that have drawn substantial investment. The firm also conducted surveys amongst the business environment in India and found an overall spirit of optimism. Nearly 80% of the respondents, for instance, indicated that they were optimistic about the future of the Indian economy over the next year, while the remaining 20% mostly registered uncertainty. Among business leaders in India, this sentiment appears to be echoed. Just short of 75% of the business leaders surveyed, for instance, believe that the sector in which they operate will grow at a faster rate than before in 2019, while most of the remaining respondents anticipated that it would remain constant. Of those who believe that their sector will grow faster in the near future, nearly 60% believe that this growth will come at a rate of higher than 5% in 2019. The report attributes this change to the GST, which is grounded in the responses to the survey. For instance, more than half the respondents indicated that the GST had made the overall business process easier in terms of logistics and other factors, although just short of half the respondents have felt no change following the implementation of the GST. Drawing from this, 66% of the respondents therefore deemed the GST to be the right policy for the country at the moment. Perhaps the biggest endorsement to the GST as a policy comes from the number of respondents who believe that the impact of the GST will increase over time. More than 90% of the respondents believe in this long term improvement and also predict that it will boost growth in their sector. Leather exports are likely to clock 5-6 per cent growth in the fiscal year ending March 31, 2019, over the value of Rs 37,000 crore (Rs.370 billion) that the industry reported in the last fiscal, according to the Council for Leather Exports (CLE). "Till November, the industry's performance has been good and we hope that the trend will continue till March," said Mr P.R. Aqeel Ahmed, Chairman, CLE. He said that the industry was heavily dependent on the European Union which accounts for 55 per cent of the total leather exports, while sales to the US are less than 1 per cent. "With the US' sanctions on China, there are lots of opportunities for India to fill the vacuum created by China," he added, as per reports. Imports of vegetable oil in December 2018 rose by 11 per cent to 12,11,164 tonnes as compared to 10,88,783 tonnes in December 2017. This consisted 11,45,794 tonnes of edible oils and 65,370 tonnes of non-edible oils, according to data compiled by the Solvent Extractors Association of India (SEA). Besides, the Association has predicted a rise in inward shipments of refined palm oil on the Customs duty cut, reports said. India and Denmark have inked an agreement on a new maritime deal that aims to boost cooperation between the two countries. The deal was done during the ongoing visit of Danish PM, Mr Lars Lokke Rasmussen, along with a business delegation looking to capitalise on thawing relations between Denmark and India. Among other things, the agreement will focus on increased dialogue and further cooperation regarding state dock control, digitisation, green technology and maritime competencies with a view to promoting quality shipping. India is seen as an important market for Danish shipping companies. With exports of over 8.5 billion kroner in 2017, India is Denmark's fourth-largest shipping market, reports said. The maiden vessel of the Container Corporation of India's (CONCOR) inaugural coastal shipping service, from Deendayal Port to VOC Port, Tuticorin via New Mangalore Port and Cochin Port, called at the New Mangalore Port on January 13, 2019. The SSL Mumbai had been flagged off by the Shipping Minister, Mr Nitin Gadkari, and others on January 10 from Deendayal Port. It unloaded 37 import containers and loaded 80 export containers at New Mangalore Port before continuing with its journey on the same day to Cochin Port. CONCOR will carry domestic and ex-im containerised cargo in its coastal shipping service which aims to provide better connectivity from southern India to western and northern India through the sea route. CONCOR has made arrangements for last-mile connectivity through rail from New Mangalore Port to Bengaluru to cater to the trade fraternity in and around the city, apart from local Mangalore requirements. In the beginning, this weekly service will have two vessels of 700-TEU capacity each, said a release. Coastal movement of cargo is seamless and environment-friendly, besides costing less compared to rail and road. The New Mangalore Port management has requested the trade to avail of this service, the release added. In a bid to enhance the logistical efficiency on India's highway network, the Road Transport Ministry is in plans to have a network of 35 multimodal logistics parks which will account for 50 per cent of the road freight in the country, according to a Ministry proposal. The Ministry, in a review meeting with the 15th Finance Commission, recently said that a draft policy on the development of the multimodal logistics parks has been prepared and shared with the Department of Commerce. Setting up of Multimodal Logistics Parks (MMLPs ) is part of the Ministry's Logistics Efficiency Enhancement Program (LEEP) and is aimed at improving the country's logistics sector by lowering overall freight costs, reducing vehicular pollution and congestion, and cutting warehousing costs, reports said. 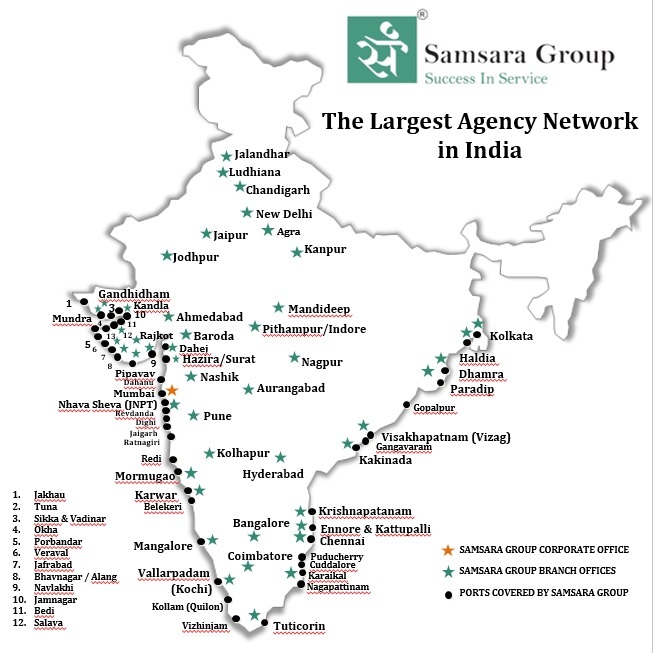 Of the 35 identified locations, 24 are situated on the national corridors planned to be taken up for development in the Bharatmala Pariyojana Phase-I, report added. The first day of the Vibrant Gujarat Global Summit 2019, on Friday, saw a majority of the MoUs, also called Investment Intentions, signed in the ports, port-led development and transport sector, it is learnt. They were highlighted by Ms Sunaina Tomar, Principal Secretary, State Port and Transport Department. The MoUs were signed by Gujarat Maritime Board (GMB) with different stakeholders. One of the MoUs was with Adani Group, with an intended cumulative investment of Rs 3,500 crore (Rs.35 billion) across three projects-development of a captive jetty at Kori Creek, cargo handling terminal at Mundra and RoRo ferry facility at Mundra. A MoU was inked with Petronet LNG Ltd with an intended investment of Rs 2,100 crore (Rs.21 billion) for expansion of their existing LNG Port Terminal at Dahej. Another MoU was signed with HPCL Rajasthan Refinery Ltd with an intended investment of Rs 1,400 crore (Rs.14 billion) for development of Single Point Mooring System and Crude Oil Terminal at Mandvi. A MoU was signed with Hindustan Petroleum Corporation Ltd with an intended investment of Rs 1,350 crore (Rs.13.5 billion) for LPG import facilities along with a jetty at Dahej Port, and LPG cavern and pumping facilities at Ankleshwar. A MoU was signed with Essar Group with an intended cumulative investment of Rs 7,485 crore (Rs.74.8 billion) across two projects-development of port-based Smart City and an LNG terminal at Hazira. Gujarat Pipavav Port Ltd (APM Terminals Pipavav) also expressed interest in development of a RoRo terminal at Pipavav, it was pointed out. Besides, a tripartite MoU was signed between Gujarat Maritime Board, J. M. Baxi & Co. and Port of Amsterdam with an intended cumulative investment of Rs 800 crore (Rs.8 billion) for development of cruise terminals at Mandvi, Dwarka, Porbandar and Veraval. A MoU was signed with Dahej Harbour and Infrastructure Ltd with an intended investment of Rs 700 crore (Rs.7 billion) for expansion of their existing port facility at Dahej, reports said. Discusses further steps to enhance trade efficiency during quarterly interactive meeting with stakeholders Jawaharlal Nehru Port Trust (JNPT), India's premier container port, is the only Indian container port to be listed amongst the Top 30 container ports globally, as per the latest Lloyds Report. JNPT notched up five spots, to be 28th on the list, compared to its previous ranking, highlighted a release. The good news of this rise in the global ranking was shared by the JNPT Chairman, Mr Sanjay Sethi, IAS at the quarterly interactive meeting with all stakeholders, organised at JNPT on January 18, 2019. This was the first stakeholder interactive meeting of 2019 and was attended by officials and representatives of the terminal operators, CFSAI, CSLA, MANSA, INSA, AMTOI, Customs and various shipping lines. Another point of adulation at the meeting was JNPT crossing the 5-million TEU handling milestone in 2018. Mr Sanjay Sethi, Chairman and Mr Neeraj Bansal, IRS, Deputy Chairman, JNPT, addressed the meeting and highlighted the various measures taken in the recent months to further facilitate the trade. The representatives appreciated the timely efforts and initiatives implemented by JNPT to enhance the operational efficiency of the port. They deliberated on new processes and the Chairman assured that all their suggestions will be taken under consideration and aptly implemented. Speaking on the global ranking, Mr Sethi said, "This is a validation of all the efforts and strategic initiatives being implemented at JNPT in order to enhance our overall port efficiency. Various new processes activated under the 'ease of doing business' initiative has not only helped in overall growth of the port business, but also allowed the ex-im trade to save time and cost, which, in return, accentuated the growth story. Gaining operational efficiency is an ongoing process and we are always looking for solutions to better our services so that the ex-im trade community benefits from it. I would like to thank all our stakeholders who are supporting us in this endeavour and together we are well on course towards achieving our goal to be amongst the top 10 container ports globally. We have already initiated various projects in order to scale up our port capacity and enhance our operational efficiency, to help us be at par with the world's best ports." In the meeting, JNPT also launched its App service to facilitate better tracking and ease the trade process for its ex-im partners. The App will allow traders to access all the relevant information about their consignment and port-related updates regarding traffic and weather, on their fingertips. The App will keep updating the relevant information at regular intervals so that traders are abreast with the latest updates. It will be available on Android and iOS, and was launched by the Chairman in the presence of the stakeholders during the quarterly meeting. The Chairman requested all stakeholders to use the App and share their feedback and recommendations regularly so that it can be upgraded as per the demand of the ex-im community. Looking ahead, JNPT is already on a major expansion drive with some key projects like the ongoing work on the mega 4th terminal, developing a centralised parking plaza, improving the port-connecting roads, widening of highways and development of coastal berth. The port is also implementing specific processes at the operational level to make it standardised and more efficient across terminals, among many other initiatives in the pipeline. India is gaining precedence as a favourable trade destination and the initiatives at JNPT have been credited for helping the country improve its position in the World Bank Ranking in trading across the borders from 146 to 80, a jump of 66. JNPT closed 2018 on a high note, crossing the 5-million TEU traffic milestone, and in December 2018 alone handled 4.45 lakh TEUs which is the highest volume of containers handled in a single month at the port, the release added. Mr Nitin Gadkari, Union Road Transport and Highways and Shipping Minister, has said that a roadmap has been developed for increasing Vizag Port capacity to 211 MMTPA from existing 152 MMTPA by 2025. Eleven port capacity expansion projects, costing Rs 2,536 crore (RS.25.3 billion), have also been identified to add 71 MMTPA capacity. He was speaking after inaugurating and laying the foundation stone of 39 National Highways projects in Andhra Pradesh today. These include construction of eleven ROBs under Setu Bhartam programme. These projects have a length of 1,384 km, and involve investment of Rs 16,878 crore (Rs.168.7 billion). The Minister further informed that 36 road projects are planned for the state under Sagarmala Programme. Of these, 35 are by NHAI/MoRTH, and one by the Port Trust. He said three projects have been completed and eight projects are under implementation. 19 railway projects worth Rs 10,000 crore (RS.100 billion) are also planned, of which nine are by Indian Railways, six by IPRCL and four by Andhra Pradesh Ports department. He said six projects have been completed, and another six are under implementation. Mr Gadkari said nine industrial clusters are being developed under Sagarmala Programme in the state. These include, port-based mega food processing park in Kakinada-Godavari Mega Aqua Food park costing Rs 373 crore (Rs.3.7 billion) which has already been completed. APIIC Mega Food Park worth Rs 375.3 crore (Rs.3.7 billion), Greenfield Electronics manufacturing cluster in Renigunta and Yerpdeu Mandal-Chittoor District-Tirupati costing Rs 9,706.75 crore (RS.97.06 billion), Greenfield Electronics manufacturing cluster in Vikruthamala Village - Yerpadu Mandal - Chittoor District - Tirupati costing Rs 5,719.8 crore (Rs.57.1 billion), Greenfield Electronics manufacturing cluster in Cherivi Village - Satyavedu Mandal - Chittoor District - Tirupati costing Rs 1,604.41 crore (Rs.16.04 billion), and 6,340 MW Power cluster - Krishnapatnam worth Rs 37,428 crore (Rs.374.2 billion) are under implementation. DPR is to be prepared for petrochemical cluster worth Rs 4,520 crore (Rs.45.2 billion) in Kakinada, export-based apparel cluster in central AP for Rs 3,321 crore (Rs.33.2 billion), and cement cluster in AP worth Rs 24,500 crore (Rs.245 billion). The Minister said under the coastal community development programme, Centre of Excellence for Maritime & Shipbuilding is being set up in Vizag with total cost of Rs 574 crore (Rs.5.7 billion). Skill gap study in two coastal districts of Andhra Pradesh (Visakhapatnam and East Godavari) prepared for implementation, especially in the port and maritime sector. Training of 1,000 persons/each year for next 3 years in port and maritime sector planned. Multi skill development centre to be set up at the Vizag Port for bridging skill gap in port and maritime sector. A sum of Rs 14 lakh has been released for DDU-GYK scheme against sanctioned budget of Rs 28 lakh in Andhra Pradesh. (Rs.3.4 billion), development of fishing harbour at Vodarevu in Prakasam district for Rs 409 crore (Rs.4.09 billion), and development of fishing harbour at Uppada -V. U. Kotapalli -M in East Godavari district - Rs 289 crore (Rs.2.8 billion). Under the Coastal Berth Scheme, nine RoRo and tourism jetty projects worth Rs 560 crore (Rs.5.6 billion) have been taken up, in addition to another three projects worth Rs 200 crore (RS.2 billion). The Minister said National Waterway-4 with total length of 1,078 km was declared in November 2008. These include River Godavari (Bhadrachalam to Rajahmundry) - 171 km, River Krishna (Wazirabad to Vijayawada) - 157 km, Kakinada Canal (Kakinada to Rajahmundry) - 50 km, Eluru Canal (Rajahmundry to Vijayawada) - 139 km, Commamur Canal (Vijayawada to Pedaganjam) - 113 km, North Buckingham Canal (Pedaganjam to Chennai) - 316 km, South Buckingham Canal (Chennai to Merkanam) - 110 km, and Kaluvelly Tank (Markanam to Puducherry) - 22 km. He said, NW-4 was extended to a revised length of 2,890 km by NW Act-2016 by including River Krishna from Wazirabad to Galagali (628 km) and River Godavari from Bhadrachalam to Nasik (1,184 km). He said development work on some of these stretches has commenced in 2017-18. RoRo services from Ibrahimpatnam to Lingayapalem are ready for commencement. He said development of this stretch will provide an efficient logistics solution to boost the economic growth of the region and facilitate the development of the capital city Amravati during its early development stage as substantial construction material is expected to be transported on this stretch of NW-4, said a release. Mr M. T. Krishna Babu, Chairman, New Mangalore Port Trust (NMPT), has said that the mechanised coal handling operations from berth 16 will commence by March. He was addressing the media here. Stating that the works are in the final stages, he said the berth is being constructed at a cost of Rs 469.46 crore (Rs.4.6 billion). Currently, coal handling is semi-mechanised at the port. With the commissioning of the new berth, the operations will be mechanised end-to-end, he noted. Talking of the other infrastructure projects at the port, Mr Babu said that the multi-purpose berth 14 would be developed as a container terminal. The RFQ (request for quotation) for it is over now. After the RFP (request for proposal) to mechanise the berth is issued, the proposal will be sent to the government for clearance. The project will be taken up in two phases with an investment of Rs 280.71 crore (Rs.2.8 billion), he said. After awarding the project to the successful bidder, the first phase would be completed in 18 months. Besides, NMPT is planning to develop berth 17 as a multipurpose berth with an investment of around Rs 200 crore (RS.2 billion) from its own resources. The Chairman said that the berth would be ready for handling multipurpose cargo by the time berth 14 is ready for handling container cargo in two years, reports said. With the aim of expanding its logistics footprint, the JSW Group has signed a Memorandum of Understanding (MoU) with the Andhra Pradesh Economic Development Board (APEDB) for a proposed investment of Rs 4,500 crore (Rs.45 billion) for building a jetty at Ramayapatnam port and also setting up an integrated steel complex in the surrounding coastal areas of Prakasam district in the state, a statement from APEDB said. The MoU was inked at the World Economic Forum in Davos, reports said. JSW Group will invest Rs 1,000 crore (Rs.10 billion) to establish the jetty and also plans to build a slurry pipeline for the group's plant in Bellary district. This pipeline will build synergies and linkages to Prakasam district. The Andhra Pradesh government has formed a special purpose vehicle, the AP Maritime Infrastructure Development Corporation, to develop the Ramayapatnam port at a cost of Rs 4,240 crore (Rs.42.4 billion) (phase-1) with eight berths. The facility, proposed to be developed on a 3,092-acre site, will have a capacity of 40 million tonnes per annum, reports added.